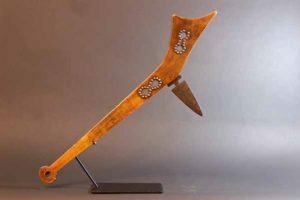 Many Plains pipe tomahawks were made with small piercings, some being holes or weeping hearts. These pipe tomahawks were numerous and easy to come by. This particular style is known as the bat-wing for the shape of one the piercings that resemble the shape of a bat. These tomahawks were more obscure and especially made for high ranking chiefs, war chiefs and particularly notable leaders. Very few are in collections but those that are tend to be very fancy in decoration. Most have file branding, tacks, special mouth pieces and also beaded and porcupine drops. These tomahawks were carried as status symbols, rarely used in battle but carried as a recognition of power and importance. Most batwing tomahawks in collections today have two piercings, one that resembles the shape of a fly and the other a bat. More rare than the double batwing tomahawks, are the triple pierced examples that typically have the third piercing in the form of a heart. The blades on the batwing pipe tomahawks tend to be very long and wide yet very thin to facilitate enough material to accommodate the piercings. Bowls on these special tomahawks tend to also be small in diameter but longer than most other pipe tomahawks of this period. Since they were made for high-ranking individuals, decorations tended to be elaborate with sometimes hundreds of tacks and extensive file branding. Most had brain tanned wrapped handles, some having drops made from ermine skins, triangular shaped brain-tanned pendents covered with various colored glass beads or porcupine quills. Also adding to the decoration frequently were fringe made from brain-tanned buffalo and twisted cord lanyards helping to ensure a solid grip on the tomahawk. Other decorations often included brass hawk bells, horse hair drops, deer toe rattles and very colorful trade beads. 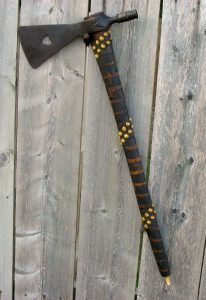 During the Plains period, tomahawks took on a different shape. The blades of the Plains Indian pipe tomahawk were wider and the heads were longer. The eyes became smaller as well as the bowls and piercings became a favorite among the Indians. Native Americans were the primary owners of these iconic weapons. Handles tended to be long and thin for use on horseback. 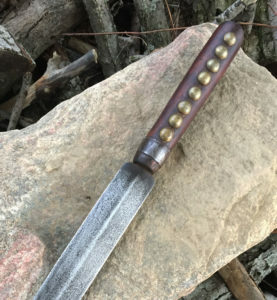 Decorations were different than the Eastern tomahawks; file branding with tacks, brass and copper wire and even carvings were favorites. 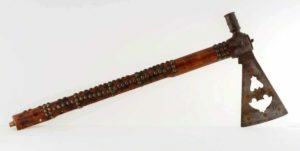 Another decoration favorite of these pipe tomahawks in the Plain style were beaded and porcupine quilled drops added to the smoking end of the handle. 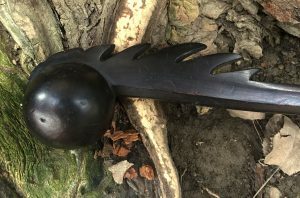 This Plains Indian pierced pipe tomahawk takes on a number of these characteristics; bowl being long and thin, blade is wide and long in length with a weeping heart piercing. The handle, also in the Plains style, has been file branded with brass round headed tacks added as decoration. You can also read more about pipe tomahawks among others in wiki too.